Peru is a country in South America that’s home to a section of Amazon rainforest and Machu Picchu, an ancient Incan city set high in the Andes mountains. The world has 103 ecosystems. There are 84 of these ecosystems in Peru. The natural hazards that Peru is at risk for experiencing include earthquakes, tsunamis, floods, landslides and mild volcanic activity. It is bordered in the north by Ecuador and Colombia, in the east by Brazil, in the southeast by Bolivia, in the south by Chile, and in the west by the Pacific Ocean. Peruvian food is a blend of Spanish and Amerindian food with Japanese, Italian, Arab, African and Chinese influences. Peru has three official languages: Spanish, Quechua and Aymara. There are 27 snow-capped mountain peaks in Peru's Huascaran National Park reaching 6,000 meters above sea level. As of 1 January 2016, the population of Peru was estimated to be 31,586,106 people. Pima and Tanguis are the finest cottons in the world and are Peruvian cottons. With an area of 1,285,216 square kilometers (496,225 square miles) Peru is the third largest country in South America, after Brazil and Argentina. In some regions of Peru it is acceptable to eat cat, the same as it is okay chicken in North America. Lima, the capital and the largest city of Peru, sits on the country’s arid Pacific coast. Though its colonial center is well preserved, today Lima is a bustling metropolis that’s one of South America’s largest cities. The highest sand dune in the world is located in Peru. It is called Cerro Blanco and is located in the Sechura Desert. It is 3,860 feet tall. Peru is made up of a variety of landscapes, from mountains and beaches to deserts and rain forests. Huascarán or Nevado Huascarán is a mountain in the Peruvian province of Yungay, situated in the Cordillera Blanca range of the western Andes. The highest southern summit of Huascarán with an elevation of 6,768 meters (22,205 feet) is the highest point in Peru northern part of Andes (north of Lake Titicaca) and in all of the Earth’s Tropics. The largest lake in South America is Southern Peru's Lake Titicaca. Peru’s Pacific coastline stretches for 2,414 kilometers (1,500 miles) along the western edge of the nation. Peru has 75 natural protected areas (15.21% of the country surface area) including 12 national parks that are preserved by the National Government. Huascarán National Park is a Peruvian national park that comprises most of the mountain range known as Cordillera Blanca (the world’s highest tropical mountain range). The park covers an area of 340.000 hectares (840,000 acres). Huascaran National Park, designated as a World Heritage Site in 1985 by UNESCO. Machu Picchu, the Inca site, had been lost to man for hundreds of years deep in the Amazon. An American explorer rediscovered the site. Peru has 12 UNESCO world heritage site. Machu Picchu is one of the most important archaeological sites in the world. It is a 15th-century Inca citadel situated on a mountain ridge 2,430 metres (7,970 feet) above sea level. Machu Picchu was declared a Peruvian Historical Sanctuary in 1981 and a UNESCO World Heritage Site in 1983. In 2007, Machu Picchu was voted one of the New Seven Wonders of the World in a worldwide Internet poll. There are 1625 types of orchids in Peru. 425 types of orchids grow naturally near Machu Picchu (an Inca site from the 1400s). Saksaywaman is a citadel on the northern outskirts of the city of Cusco, Peru, the historic capital of the Inca Empire. Sections were first built by the Killke culture about 1100; they had occupied the area since 900. The complex was expanded and added to by the Inca from the 13th century; they built dry stone walls constructed of huge stones. Approximately two-thirds of Peru's land is made up of the Amazon Rain Forest. Qurikancha or Qorikancha was the most important temple in the Inca Empire, dedicated primarily to Inti, the Sun God. It was one of the most revered temples of the capital city of Cusco. The Spanish colonists built the Church of Santo Domingo on the site, demolishing the temple and using its foundations for the cathedral. The world's 8th largest coffee producer is Peru. Peru is also the 5th largest Arabica bean producer. The National University of San Marcos is the most important and respected higher-education institution in Peru. It was chartered on May 12, 1551 by a royal decree signed by Charles V, Holy Roman Emperor, which makes it the oldest officially established university in the Americas and, as such, one of the oldest universities in the world. Peru is the largest asparagus exporter in the world. In 2012 Peru exported 117,000 tonnes of asparagus. The world's 6th largest gold producer is Peru. The Nazca Lines are a series of ancient geoglyphs located in the Nazca Desert in southern Peru. They were made by the Nazca people between 500 B.C. and 500 A.D. The hundreds of individual figures range in complexity from simple lines to stylized hummingbirds, spiders, monkeys, fish, sharks, orcas, and lizards. There are more than 55 types of corn grown in Peru. Cerro Blanco, 14 kilometers (8.7 miles) east of Nazca, is the highest sand dune in the world: 2,078 meters (6,817 feet) above sea level and – more importantly – 1,176 meters (3,858 feet) from base to summit, that’s higher than the tallest mountain in England and numerous other countries. Potatoes were originally from Peru. Cotahuasi Canyon near the city of Arequipa is the deepest canyon in the world. At 3,354 meters (11,004 feet), it is almost twice as deep as the U.S.’s Grand Canyon, which is 1,857 meters (6,093 feet) deep. Peru's official language is Spanish but many Peruvians also speak Quechua (Inca language) and Aymara. It is also believed that Natives east of the Andes Mountains speak up to an additional 13 languages. The Amazon River is the largest river by discharge of water in the world, and the second in length. It rises high in the Peruvian Andes at Nevado Mismi and ends in the Atlantic Ocean approximately 6400 kilometers (4000 miles) from its source. Peru's currency is the Nuevo Sol. Peru has some of the best surfing in the world. Chicama [pic. below] and Pacasmayo both claim the world’s longest ridable wave (2.2 kilomters (1.5 miles) long). 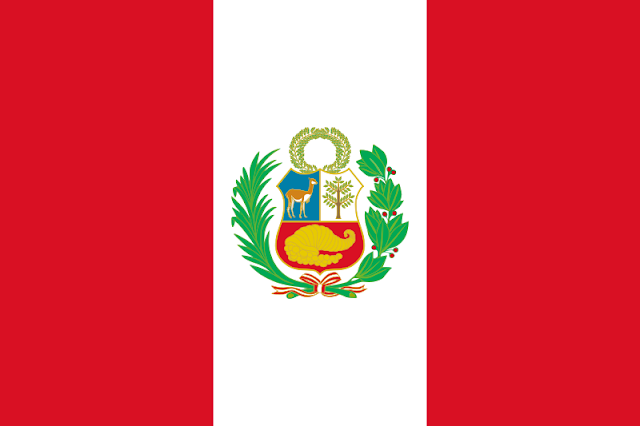 Approximately one quarter of Peru's residents live in Lima. Approximately 30 million people live in Peru. Peru and Chile both claim the pisco sour as their national drink, and each asserts ownership of the cocktail’s base liquor—pisco; commonly mixed with soft drinks like Coca-Cola (Piscola) or ginger ale or vermouth. But the most common version is the Pisco sour where it is blended with lemon juice, sugar, ice, and beaten egg whites. When Peru was under Spanish rule the capital city was Lima. It was South America's most powerful city. Lima is Peru's capital city. The Peruvians celebrate Independence Day on July 28th and 29th each year. The celebration is called ‘Fiestas Patrias' which means ‘Patriotic Holidays'. La Rinconada, the highest elevation human habitation in the world has a goldmine where miners work for 30 days without pay. On the 31st day they are allowed to take as much ore as they can carry on their shoulders. Peru is the world’s third largest producer of copper, silver, zinc and tin, and the sixth largest producer of gold. The coca plant (Erythroxylum coca) has been used for thousands of years in the Andean world, mainly for its medicinal properties and religious significance. Coca leaves have been used as a stimulant to overcome fatigue, hunger, and thirst and they are particularly effective against altitude sickness.